The HF10 Series of antenna matching transformers are fully encapsulated heavy duty units designed for the most arduous environmental conditions. 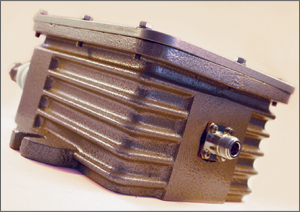 The transformers are housed in a cast aluminium case, vacuum impregnated with epoxy resin and finished in epoxy paint for added protection. High purity alumina ceramic insulators with arcing horns are fitted as standard and an integral static drain to earth provides additional protection against lightning induced EMF’s. For added EMP proof operation no capacitors are used in the transformer circuit. A wide selection of unbalanced and balanced impedance ratios are available to complement most antenna configurations and enquiries for non-standard arrangements are welcome. No compromise has been made to provide a unit of the highest standard of reliability. Cooling: Natural convection, silicone transformer oil, pressure relief valve fitted. Shipping dimensions: 700 x 600 x 500 mm approx.